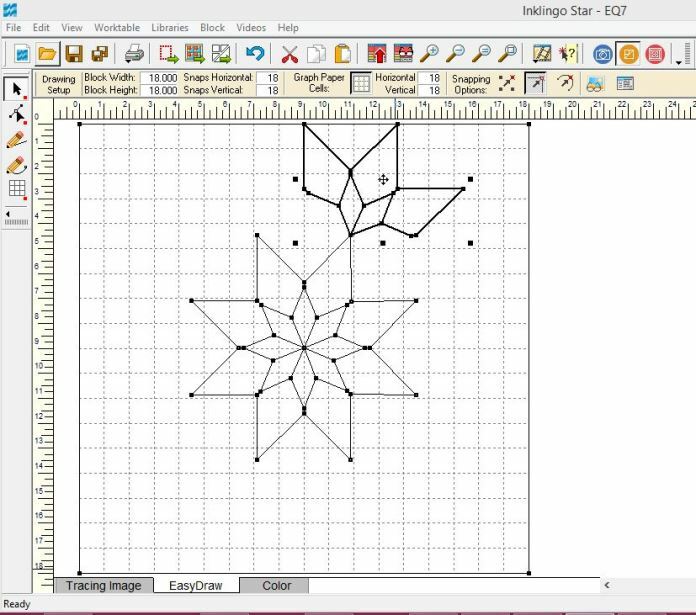 Linda’s latest Inklingo collection is the Inklingo Star. Linda has been teasing viewers on the Inklingo Facebook page with samples of the 9 inch block. 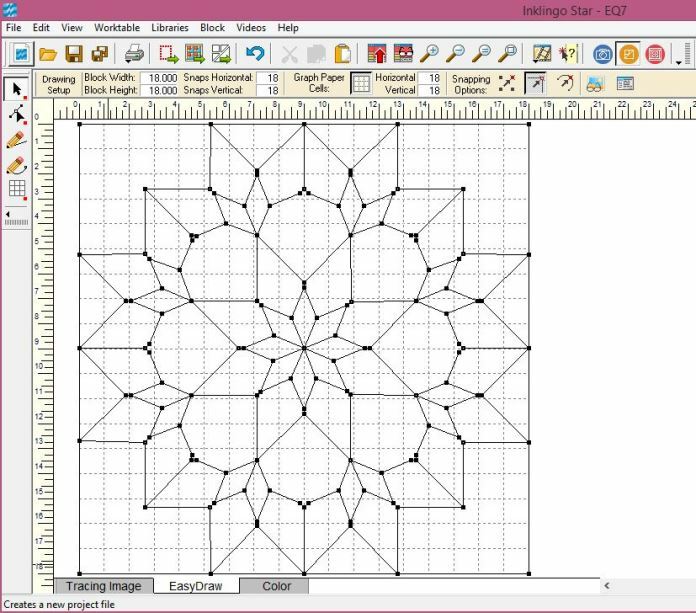 Linda also designed an 18 inch block she is calling Morse Star. 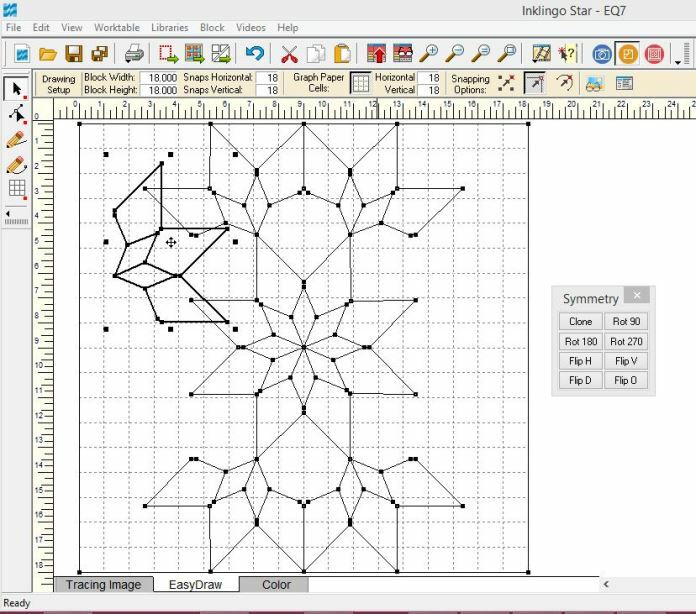 I was able to use Linda’s original EQ7 project file for the Inklingo Star to draft a Morse Star block in Electric Quilt. 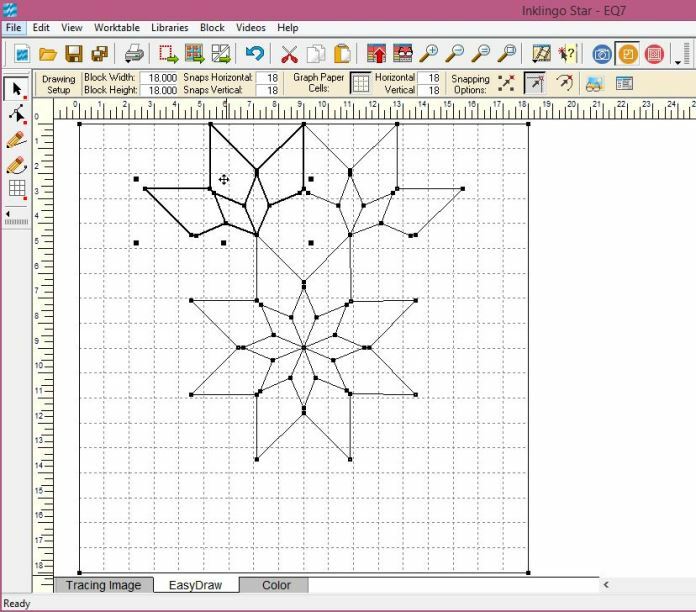 The project file is available to download and I give step-by-step directions on drawing the block in EQ7 below. 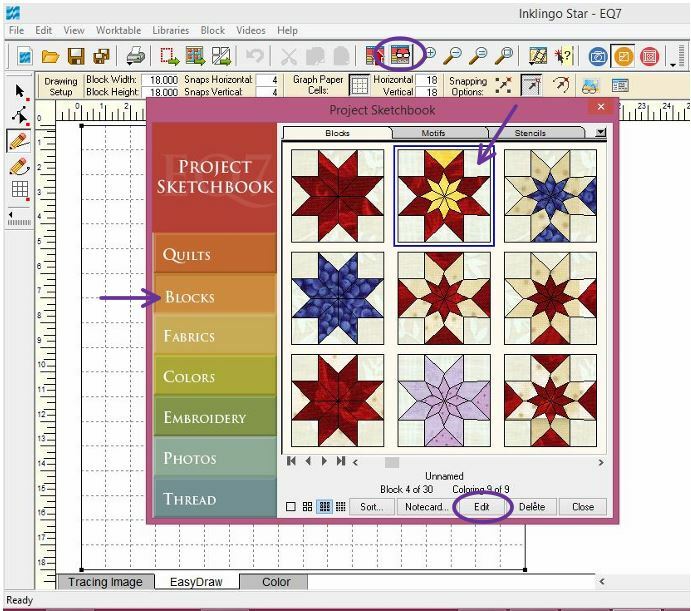 I opened a new project in Electric Quilt called Inklingo Star rather than opening Linda’s project file so that my default fabric palette would be preserved. 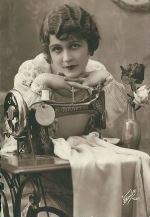 [Electric Quilt project files are sometimes compressed and unused fabrics are deleted from the file.] 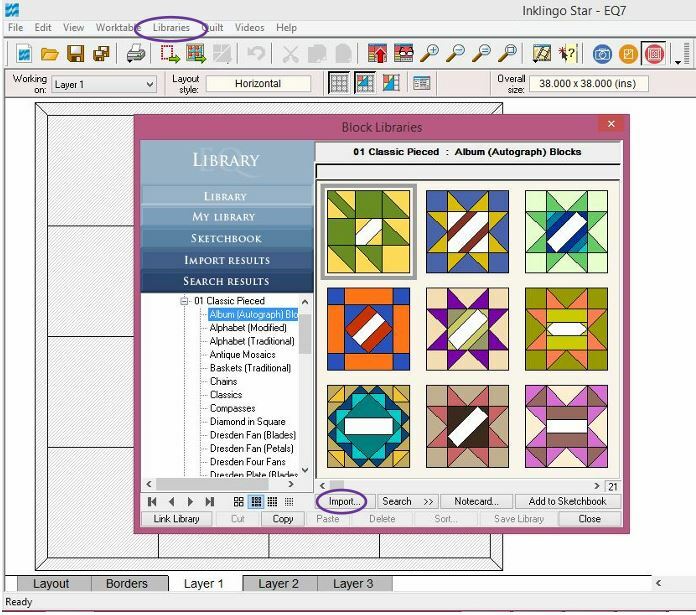 The next step is to import Linda’s project file blocks into my Inklingo Star project. Click > Libraries > Block Library > Import. Find the folder where the InklingoStarForBlog project file is saved. Click on the file name and click > Open. 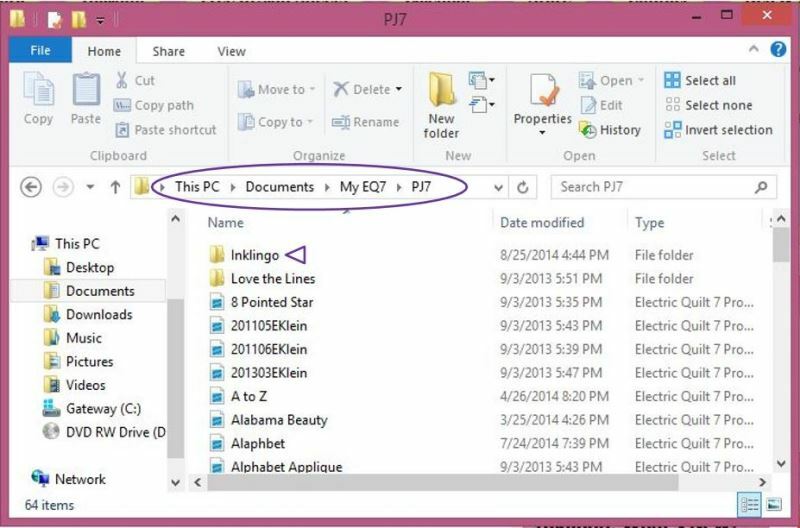 Hold down your Ctrl key and click on “A” to highlight all the blocks in the file. Click > Add to Sketchbook. 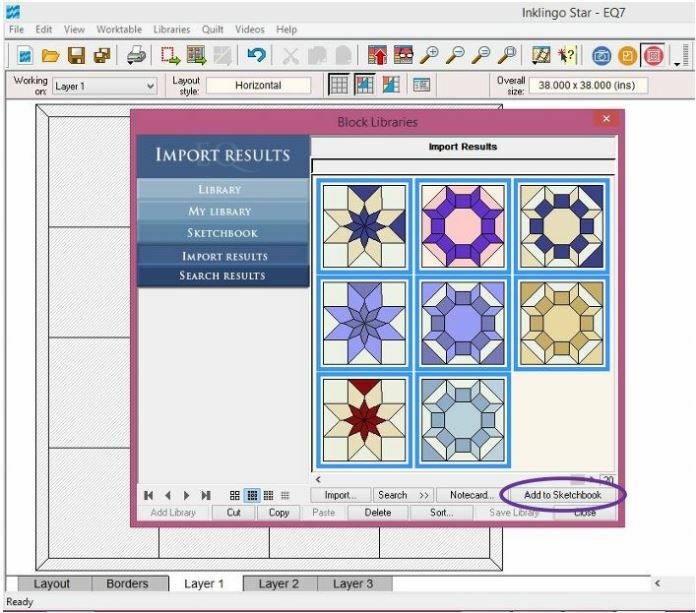 All of Linda’s blocks and quilt layouts will be added to your project file. Let’s get ready to draw in EQ. [There is actually very little drawing required. Most of it is copying, pasting, flipping and rotating.] First set up an 18 inch EasyDraw block. 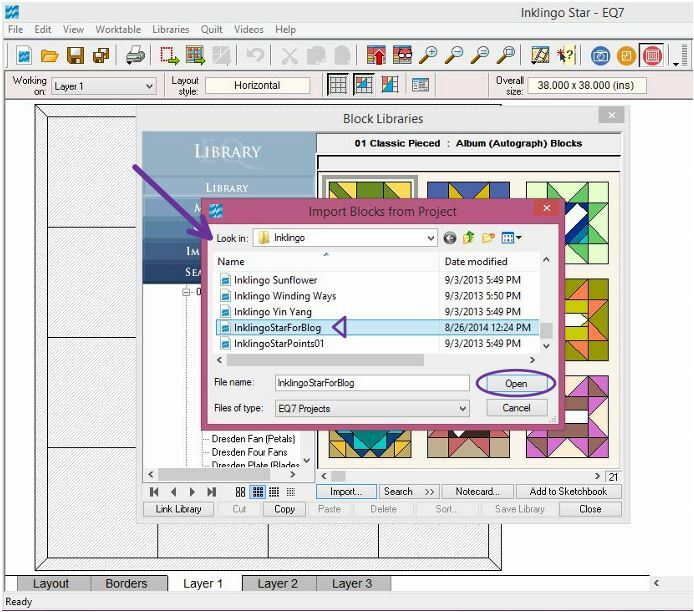 Click > Worktable > Work on Block. 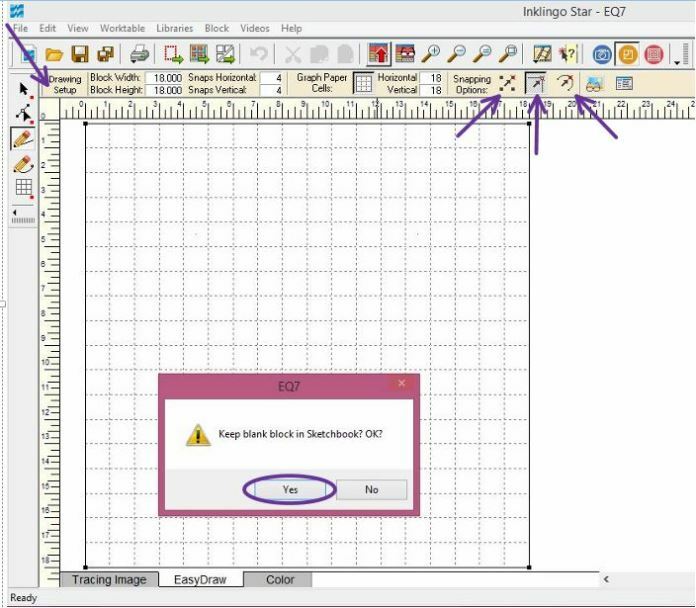 [If your drawing table is not blank, Click > Block > New Block > EasyDraw Block.] 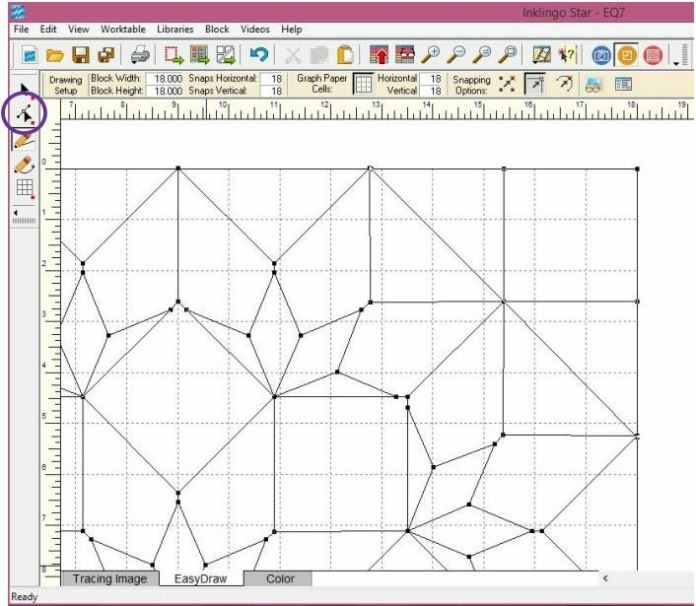 On the Drawing Setup ribbon: Set Block Width & Height to 18. 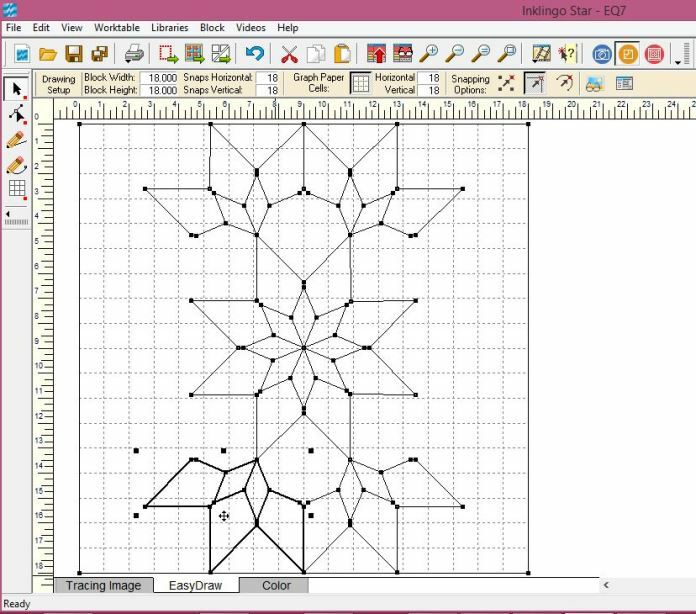 Set Graph Paper Horizontal & Vertical to 18. Be sure Snap to Grid is OFF, Snap to Nodes is ON and Snap to Lines/Arcs is OFF. Click > Add to Sketchbook > Click > Yes to save blank block. Click on > Sketchbook > Blocks. Click on first Inklingo Star block to highlight. Click > Edit. Click Ctrl/A to highlight the whole Inklingo Star block. Click Ctrl/C to copy the block. 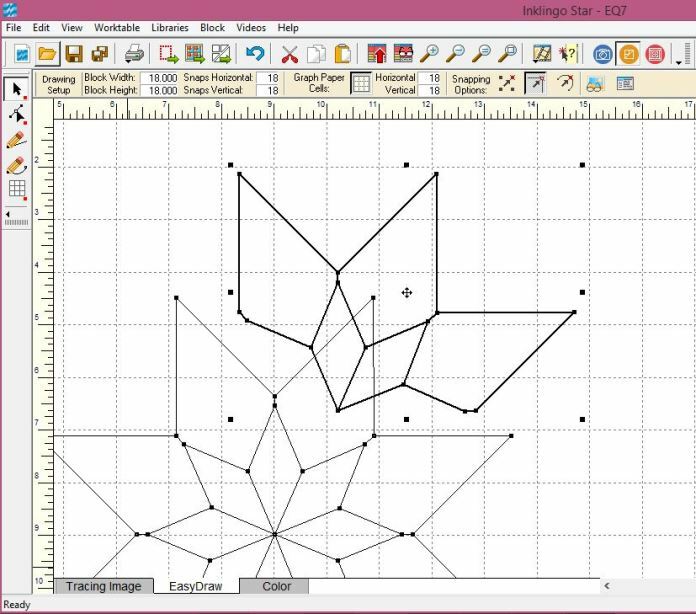 Click > Sketchbook > Highlight your Blank block > click Edit. [It should be the very last block] Click Ctrl/V to paste the copied block to your blank block. Center the block by clicking on the Move button [looks like crossed arrows at the very center] and moving the block into place. 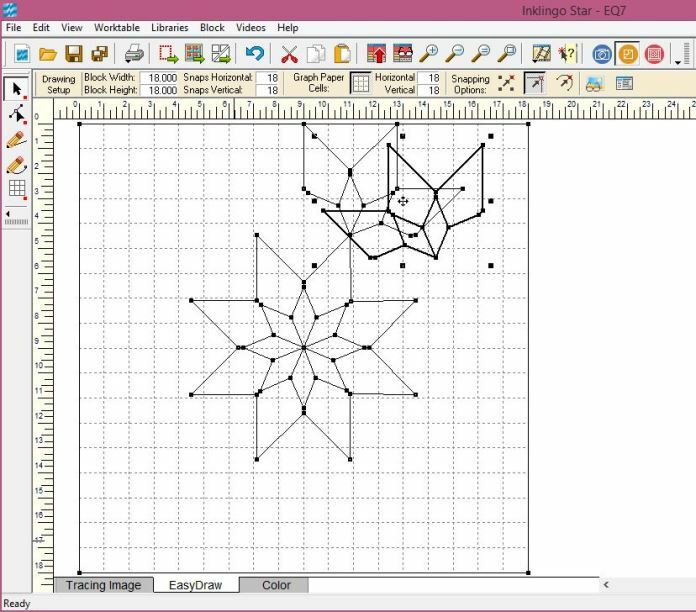 This is the very center of the 18 inch Morse Star block and needs to be resized to 9 inches—half its current size. Click > Block > Resize. In the Resize box, change the Horizontal and Vertical percents to 50. [See above] Click > Okay. Your block should look like this one. We need to Zoom In for the next steps. Click on the Zoom icon. [The magnifying glass with the + sign.] Click on your drawing table while holding down your left mouse button and drag a box around the top right section of the block to enlarge. Now we are going to copy a portion of the block and paste it adjacent to the original block. Be sure you have the Pick Tool selected. Hold down Ctrl & Shift and one-by-one click on the lines inside the purple area I’ve drawn in the picture below. The lines will get bolder when you click on them. HINT: If you need to, zoom in again to select those tiny lines. If you accidentally click the wrong line, click on it again to deselect it. To return to your normal screen, click the magnifying glass with the square. Once you have all the lines highlighted, Click > Ctrl/C > Ctrl/V to copy and paste the selected lines. Use the Move button to move the copied portion to the outside point of the kite as shown below. 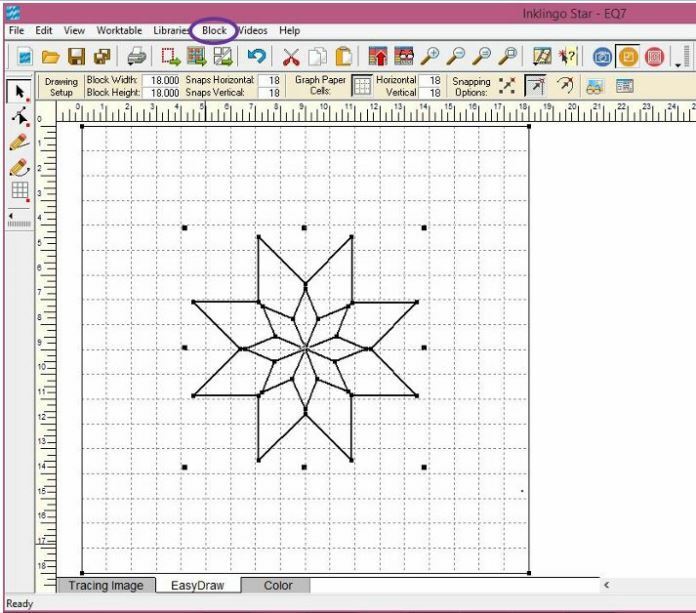 Click Ctrl/C and Ctrl/V to copy and paste a new section to your drawing board. This section needs to be flipped with the Symmetry tool. Click > Block > Symmetry. In the Symmetry box, Click > Flip H.
Move the section to the left—next to where you moved your first pasted section. HINT: If you accidentally click on your drawing board before you move your grouped section, it will be deselected. 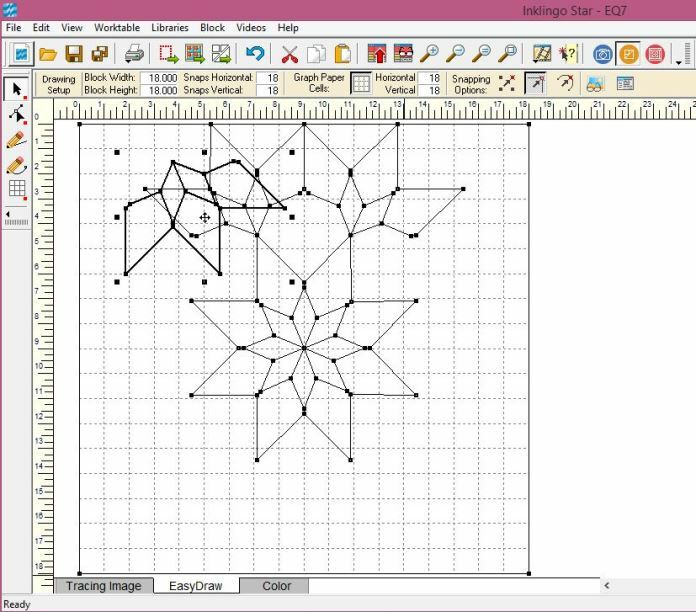 The lines will go back to normal size and ungroup themselves. Clicking on the Undo icon should reselect your grouped section so you can move it again as a group. 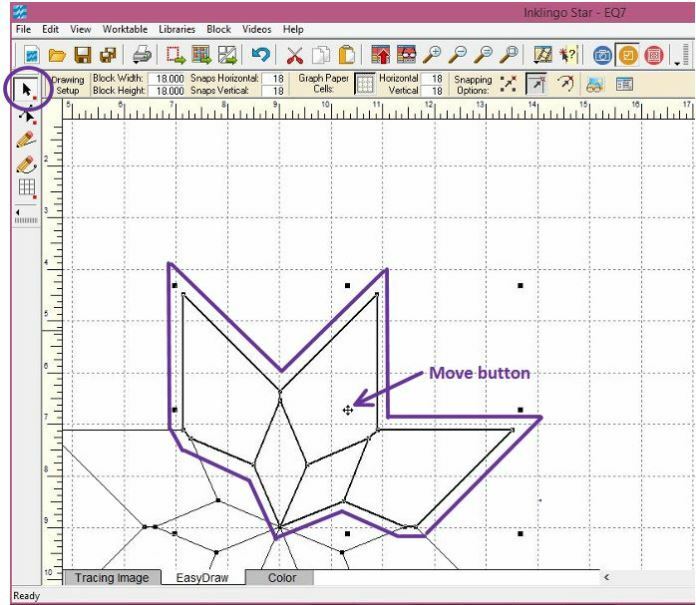 Copy and Paste a new section > Choose > Flip V on the Symmetry box. This section goes on the bottom of your block. Move the section to the bottom of the block. Copy, Paste and Flip H for the second section on the bottom. 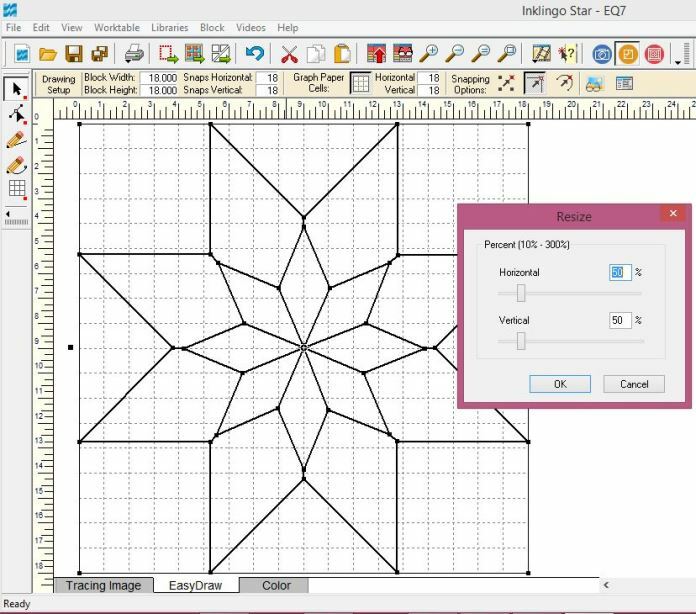 Copy, Paste and Click > Rot 90 on the Symmetry box for the next section which goes to the side. For the last 3 sections, do the following:  Copy, Paste, Flip V, Move;  Copy, Paste, Flip H, Move;  Copy, Paste, Flip V, Move. Your block should now look like the one pictured below. Finish drawing all the lines for the half diamonds. 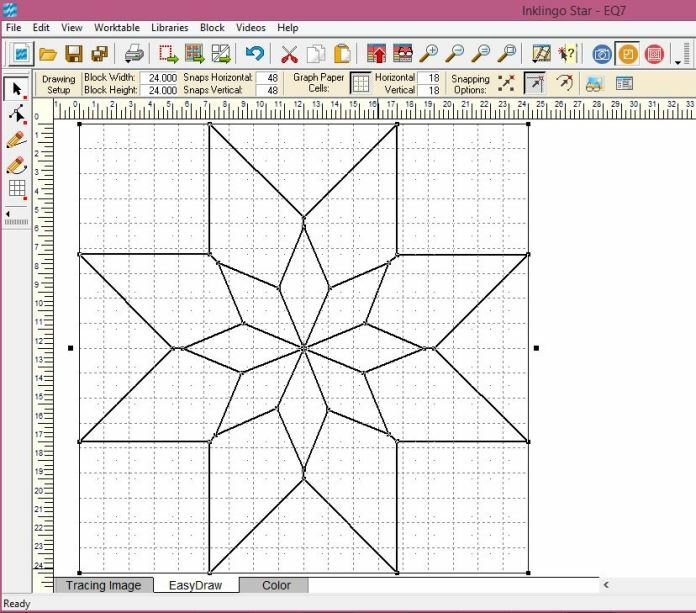 Draw the lines for the squares and half-square triangles in the 4 corners of the block. 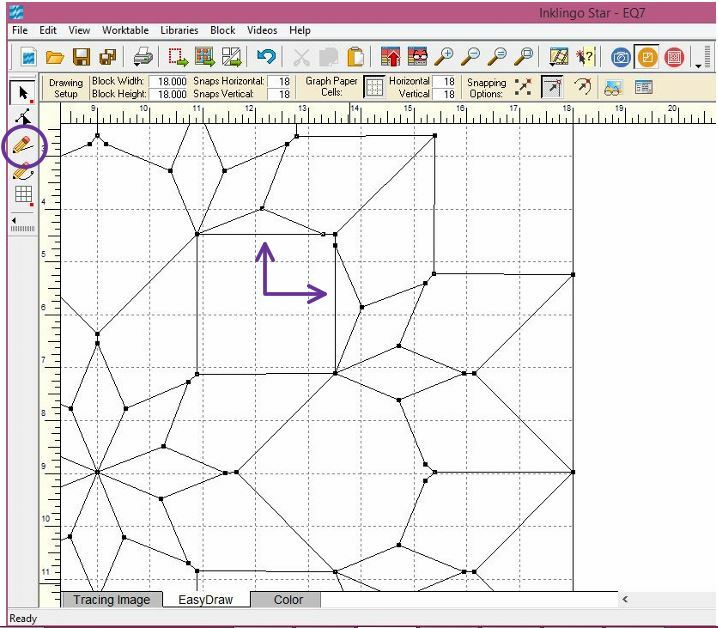 After you have drawn all your lines, double check all the nodes to make sure they form a closed shape. [They should all be touching together to form one node.] If you see any spots that are open, Click the Shape Tool. Click on a node that needs to be nudged and move it over a smidgen to get it to snap to its neighbor. Save your block in the Sketchbook.